Changes in your diet and many of the other factors that cause diarrhea in non-pregnant women can cause diarrhea during your pregnancy. In most cases, symptoms will be mild and resolve without treatment. However, there is cause for concern if you have a lot of diarrhea several times a day or it lasts for several days. This can put you and your baby at risk, especially if you have other symptoms with the diarrhea. Diarrhea happens as frequently in the pregnant and non-pregnant woman alike, but may be more common at or near the onset of labor. It could potentially make you sicker during pregnancy because your immune system is weaker. If the diarrhea is caused by an infection it may lead to premature rupture of membranes, or premature labor. Depending on the cause and severity, the diarrhea can also affect your baby. If you get sicker and become malnourished your baby won't gain weight. If you get moderately to severely dehydrated and/or lose consciousness your baby could get into distress or die. Your baby's immune system is also weak because it is not yet fully developed. Infections can cross the placenta and infect your baby. There are several causes of diarrhea. The monograph from the American College of Gastroenterology is an excellent overview of the causes of diarrhea (page five) and bowel disease in pregnancy. Some of the causes or symptoms of diarrhea are not life-threatening and can be treated at home. Others are more likely to affect you and your baby and you may need to be treated by a doctor. 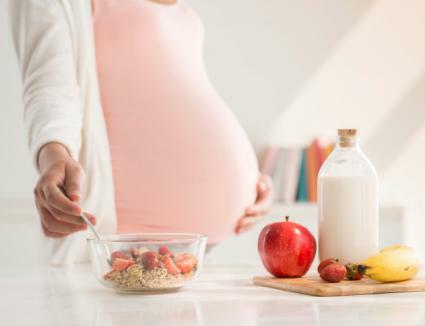 Change in Diet: Pregnant women who make big changes in their diet and start eating more fruits and vegetables and water may begin to notice more frequent, looser stools. It is better to make gradual changes in your diet when you are pregnant. Concentrated Sugared Fluids: Drinking more of these may increase fluid secretion into the gut. Prenatal Vitamins: Some women experience diarrhea when taking prenatal vitamins. Prenatal Iron Supplements: Taking laxatives to treat constipation from the iron causes looser stools. Antibiotic Treatment: Taking antibiotics can decrease the normal bacteria in your bowel and cause overgrowth of others such as Clostridia difficile, which can cause diarrhea. Herbal and Other Over-the-Counter (OTC) Medicines: Certain non-prescription medications and supplements can increase bowel activity. Hyperthyroidism: This condition is common in pregnancy and diarrhea is one of the symptoms. Prostaglandins: These increase in the third trimester to prepare the uterus for labor. They cause increased water and electrolyte secretions in the gut and a hyperactive bowel. Irritable Bowel Syndrome: Irritable bowel syndrome is an underlying hyperactivity of the bowel which can lead to diarrhea or constipation. Symptoms can be exacerbated by a change in your diet. Infections are more likely to cause severe complications for you and your baby. IBD involves inflammation of the inner lining of parts of the bowel. IBD includes ulcerative colitis and Crohn's disease. Both are common in women in the childbearing years (15-44) and diarrhea is a frequent symptom. The monograph on pregnancy and gastrointestinal disorders from the American College of Gastroenterology, cited previously (page 66) states that a new diagnosis of IBD during pregnancy is rare. It is best to make sure that your IBD is well under control before you get pregnant. If your IBD is inactive at the start of pregnancy, flare-ups during pregnancy are rare. If IBD is active at the start, however, flare-ups are common and difficult to manage. It is important to treat symptoms of active disease during your pregnancy, such as diarrhea, to decrease risks to the baby or premature labor. If the diarrhea is mild and lasts less than three days and you have no other symptoms, you can self-treat at home. When in doubt, check with your doctor or midwife. It is important to drink more water and replace electrolytes lost. Eating probiotic yogurt may replace your normal gut bacteria. Eat a softer diet that includes the mashed bananas, applesauce or stewed fruits, mashed potatoes, rice and toast until symptoms improve. Avoid milk if you are lactose intolerant and gluten if you are wheat intolerant. Eat less fatty or fried foods and fiber until the diarrhea stops. Avoid prunes and dried sugared fruits and sugared drinks, which can increase fluids in your stomach and cause diarrhea. There a few medicines that can slow food passage through the bowel and decrease the amount and frequency of diarrhea. These are available over-the-counter (OTC). Kaopectate does not cross the placenta and is safe to take at home if you need to, but check with your doctor first. Kaopectate and Imodium are also regarded as safe in pregnancy. Note: The best advice is to take only the medicines you need during your pregnancy. Don't take herbal or over-the-counter-medicines (OTCs) without checking with you doctor first. The doctor will take a complete history, which can give him many clues to your diagnosis. He will check on the baby's health and do an ultrasound, if needed. The physician will check to see if you are in labor or your membranes are ruptured. The doctor will check your temperature as a sign of infection. Your blood pressure will be checked, as this can be a signal of dehydration. The electrolytes in your blood will be checked to see if you need more by intravenous (IV) fluids. Your stool may be checked for parasites and their eggs, do a stool culture, or check for C. diff. The doctor will treat any underlying bowel, thyroid or other medical disease. You may be hospitalized for IV fluids and electrolytes and to monitor your baby. If your diarrhea continues after initial treatment, the doctor may send you to a gastroenterologist who might order a flexible sigmoidoscopy, which is safe in pregnancy. Your doctor may give you antibiotics if he suspects a bacterial infection as well as prescribe an antidiarrheal medicine. Wash fruits, vegetables, meats, poultry and seafood carefully. Avoid cross contaminating your foods; wash cutting boards and knives well after each use. Avoid raw meats, poultry, seafood and milk. Be careful about which restaurants you choose. These are good rules to follow at all times but are even more important during your pregnancy. Speak to your medical provider if you have more questions.